Click on the image below to visit Grand Canyon areas proposed for development. She says she sees him in the desert blooms, feels him in the breeze and senses him when she takes steps toward the edge of the canyon. But the place Yellowhorse holds sacred, where she says her prayers and connects with her ancestors, could someday be the site of commercial development and an aerial tramway, along with the thousands of tourists that would follow. This spot on the north edge of the canyon is known as the Confluence. 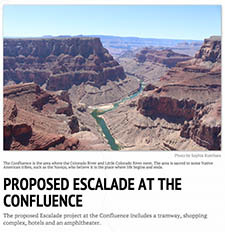 Developers want to build a project called the Escalade to make the area a commercial hub for tourists to learn about Navajo culture and have easy access to the bottom of the canyon and the Confluence. But the land is considered sacred to the Navajo and treasured by hikers and conservationists who worry any development will tarnish its untouched beauty and strain water resources. Yellowhorse is the spokeswoman for Save the Confluence, an organization opposed to any changes – even though the developers behind the project say they will leave the sacred areas untouched. “When man comes in and does the blasting, the tearing into the heart of our mother, where does that construction end? Where will it stop? What’s next for this area?” she said, sitting on a cliff overlooking the Confluence. Some 25 miles away in Gap, Larry Hanks takes a dirt road to his small house, pointing out two couches, a wood-burning stove, propane bottles, a gas lantern. There is no electricity, no running water, not even a bed. He lives here with his 10-year-old daughter. He and others in the Bodaway-Gap Chapter of the Navajo Nation support the Escalade project because they say it will provide jobs in one of the poorest and most undeveloped areas of the Navajo reservation. People like Hanks say the development will bring hope and employment. Outgoing Navajo Nation President Ben Shelly also has said he supports it, but he didn’t respond to multiple calls for comment. Arizona Rep. Albert Hale, D-St. Michaels, and a partner in the project, says it will help the impoverished Bennett Freeze area. The Bennett Freeze, imposed decades ago by federal authorities, prohibited any development on parts of the Navajo reservation because of a long-standing land dispute between the Navajo and Hopi tribes. 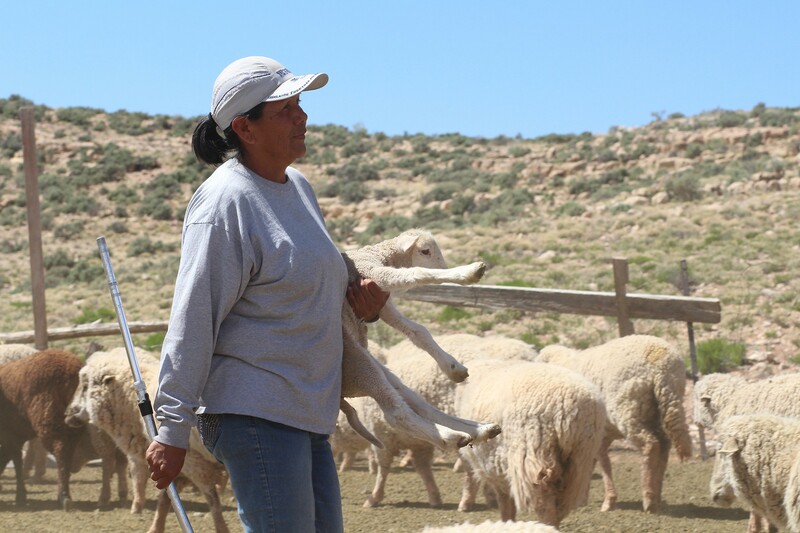 “There are no jobs available on the Indian reservation,” said Hale, a former Navajo Nation president. “So the people who are opposed, are they willing to step out and say, ‘You know, we have got to look at these things, we have got to find a way to keep our children here,’ and if we continue to not do anything our children will continue to move off because the opportunities are off the reservation. Newly elected Navajo President Russell Begaye disagrees. Lynette Willie, his communications director, said Begaye thinks more conversation is needed. Marie Peyketewa, whose family has worked the land as sheep farmers for generations, has the same concern. She said the project hasn’t been properly explained to the people and that Navajo Nation leaders have refused to meet with her. Peyketewa said a better way to bring prosperity would be to build the houses and bring the water and power lines necessary to improve their quality of life, rather than counting on the Escalade project. Yellowhorse has been coming to the Confluence since she was a girl. Development around the Grand Canyon long has been debated between investors looking capitalize on the area and conservationists and nearby residents who want to protect the natural wonder. Just miles from the South Rim of the Grand Canyon sits a cluster of hotels and small homes, a McDonald’s, a general store and a gas station, comprising the town of Tusayan. With fewer than 600 residents, most of whom live in employee housing, the town is primarily a pit stop for Grand Canyon visitors. 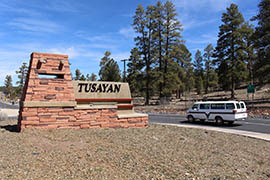 Tusayan also has been in the middle of a years-long conflict over development plans. Some say the area is in desperate need of permanent housing for residents, while others say it can’t handle a large development because of water concerns. For more than 25 years Italian investment group Stilo has been looking to develop the town and even helped get it incorporated, but town members and Grand Canyon park officials say there isn’t enough water to sustain the planned 2,000-home development on 40 acres of land. For Mayor Greg Bryan, the development is about affordable housing and helping residents put down roots in the town instead of relying on their employer for housing. Bryan said affordable housing, rather than employee housing, would help build up the community. “We have the opportunity to grow the town and to grow leadership because they will have roots, they will have skin in the game, they will have the desire to build something for them and their family and their children,” Bryan said. Additionally, the development would greatly improve residents’ standard of living, Bryan said. Clarinda Vail, a third-generation Tusayan resident, said the interests of developers and Town Council aren’t in the best interests of the town. “They are, in my opinion, in this area just to line their pocketbooks, and they don’t have their heart here the way that my family has had their hearts here for years,” Vail said. But it’s not just small-town politics causing a rift. Figuring out how to supply water for the development is also an issue. Dave Uberuaga, superintendent of Grand Canyon National Park, said the proposed development wouldn’t serve the best interests of the town or the public. Residents like Vail have been asking the developers how they plan on finding water, but Stilo acknowledges having no answers. Tom De Paolo, managing director of Stilo’s U.S. operations, said the company has looked into repurposing a pipeline to bring in water, but it doesn’t have any set plans. The Grand Canyon National Park had more than 4.5 million visitors in 2013, ranging from sightseeing families to serious hikers like Grant Emerick. Emerick has been hiking the Grand Canyon with his father since he was 8 years old. 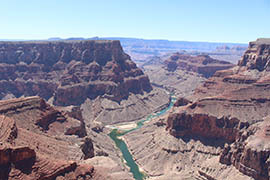 The Little Colorado River flows from the left into the Colorado River in the Grand Canyon at a site, called the Confluence, that is sacred to many Navajos and other Native Americans. A proposal to put a commercial development on the rim and build a tramway to the bottom is pitting conservationists against those who say it would boost the Navajo Nation's economy. 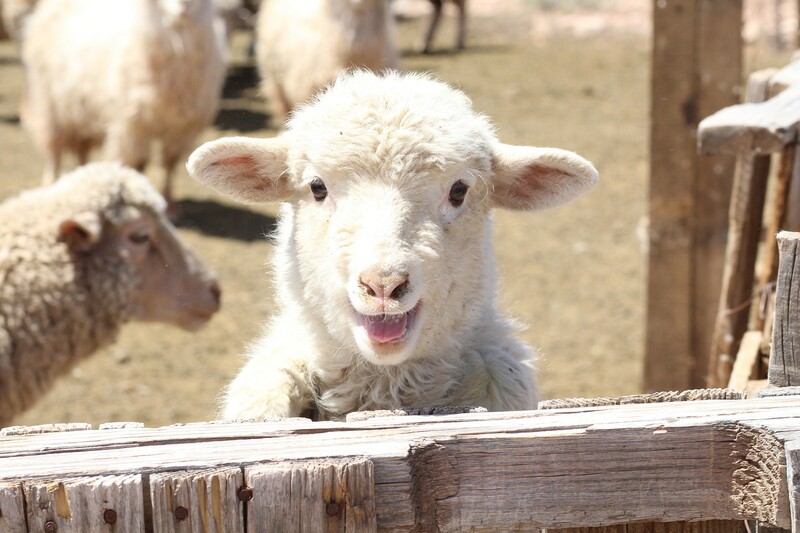 Generations of Marie Peyketewa’s family have raised sheep near the Navajo Nation community of Gap. She says a development proposed on the reservation at the Grand Canyon the project hasn't been properly explained to the people and that Navajo Nation leaders have refused to meet with her. One of Marie Peyketewa's lambs. 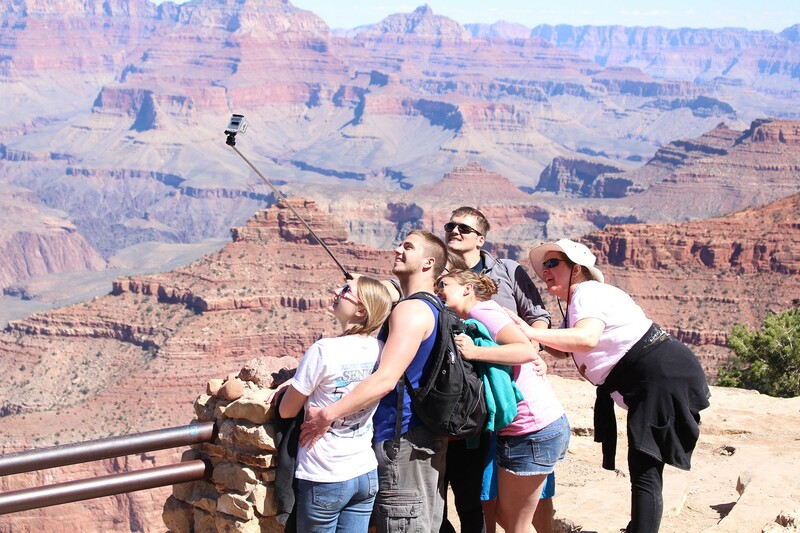 Tourists pose for a selfie in Grand Canyon National Park. 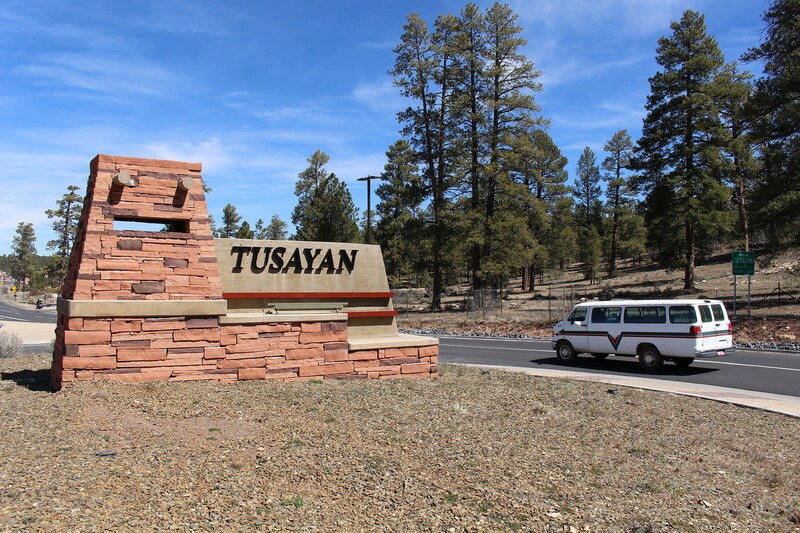 A proposal to build hundreds of homes in the community of Tusayan just south of Grand Canyon National Park has some saying it would tax limited groundwater supply and others saying it would provide much-needed housing for area workers.